In the iconic SoPi district of Paris, close to the Opera, the Louvre and Montmartre, the ibis Paris Opéra La Fayette hotel is ideal for your stay in the center of Paris. 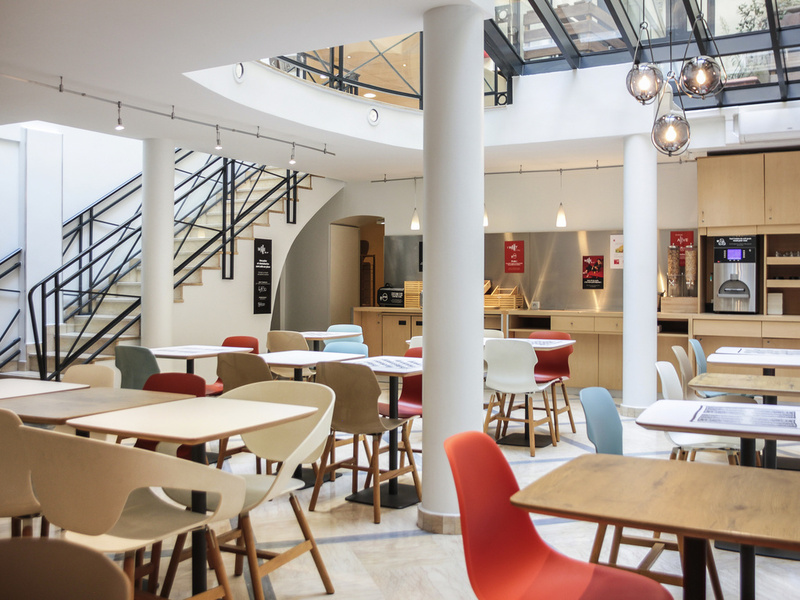 The ibis Paris Opéra La Fayette hotel is ideal for tourists, families and professionals alike thanks to its location in the center of Paris. The ibis Paris Opéra La Fayette is a 3-star hotel with 67 renovated and air-conditioned rooms. The hotel has free WIFI and a snack bar, and is located a 10-minute walk from department stores, the Grands Boulevards, the Folies Bergère, Opéra Garnier and the Olympia music hall. The ibis Paris Opéra La Fayette hotel is in the heart of Paris, near Galeries Lafayette, the Palais Garnier opera house, the Grand Rex movie theater and the Louvre museum. Explore the iconic surroundings of Montmartre. The location of the ibis Paris Opéra La Fayette hotel gives you quick and direct access to the capital's various attractions. Metro lines 3, 7, 8, 9 and 12 will take you around Paris so you can make the most of your stay. Twin, triple and quadruple rooms available on request! Just like being at home... Welcoming, modern, spacious and comfortable, with a cozy bed and functional bathroom. There's everything you need to enjoy your stay and much more besides. The latest generation Poppy Style Rooms have been completely renovated. Relaxation program...A bite to eat, something to drink... It's the perfect spot for business meetings or relaxing at any time of day. Stayed here for the Paris Marathon, the staff were really accommodating and looked after me. They gave me a nice quiet room and the night before the marathon, left me a breakfast cereal bar, a bottle of water and a packaged moist towel for after the run. A superb little touch I wasn't expecting! It was a really awesome experience. The hotel staff was very helpful. My daughter was sick and staff were very attentive with all we needed. Over all, the hotel have good accommodations, excellent localization halfway between Louvre and Montmartre (walking distance from Louvre, Opera and Moulin Rouge) and near metro station. I’d like to thank all the staff again. We expect to be back soon. Brilliant. From beds to breakfast it was a lovely stay. I have stayed many times before in this hotel when the standard and the price corresponded. It was not the case any more: approximately 135 € per night without breakfast is far too much. The room was clean and spacey, but as in the case of the Ibises, lacking in some important features like a safe and a fridge. What's more, a hideous noise from the street (the city cleaners) woke me up at 6 AM Saturday morning. Thus the sound isolation was not effective. I had asked a room on the upper floors but only got 4th floor. However, I came to the hotel at 2 PM, thus not a late arrival. Sophie was amazing. I had to make a video conference and I had nowhere to do it. She let me go to a seminar room and I was there for an hour. It was quiet and I could make the conversation without interruption. Friendly, helpful staff and good buffet breakfast. More towels in room please and a kettle. Overall very happy with the hotel. There was an issue with a rather horrid sewer type smell in the lift and the corridors, although not in the room. Had to ask for more towels - one bath towel each and no hand towel is not really acceptable. Really missed a kettle in the room for a cup of tea after a long day out in the City. Good location. It's our second time in this hotel. Everything there is fine for a three stars hotel (location, food, cleanliness, service etc) except the persistent elevator problem. Each time a couple of days into our stay an elevators would stop working and it would take days to fix it. So if unlike us you have a difficulty walking up and down to the third or fourth floor a couple of times a day, it might be a serious problem. Just two issues that I noticed. The rooms were too tight and there were not enough towels. Nice rooms, we stayed 11 nights so we got a big one. Clean and quiet. Excellent location. One thing we have to ask: please replace the dirty and smelly rug in the elevator which smells sewer. Stained and filthy. Other thing we have to say: the last day we needed to stay in the room till 18:00 time to go to the airport. We have been charged with a full day. During the years we did this arrangement a lot of times all around Europe, and we have always paid half day, half price. Not here. We paid an additional full price. Otherwise, we enjoyed our stay. Reasonable but left with lasting impression of sewage smells in the stairs and corridors. Good location but smelly hotel. Dear NEIL J., Thank you for taking the time to tell us about your experience at the ibis Paris Opéra la Fayette. I am sorry that your experience did not meet your expectations; please allow me to express my sincerest apologies. At Ibis, we strive to provide a superior service experience for every customer; therefore your feedback is very important to us. Please rest assured that we are taking the appropriate measures to address the problem and prevent future occurrence. We appreciate your sharing your concerns, and it is our hope that you will give us the opportunity to better serve you in the near future. Sincerely, Pauline, Front office manager. Good location between city center, exhibition area and airport The first night was too noise and I got the room changed the second night. Room was sufficient, clean, would like to see some coffee/tea facilities in the room. Staff very helpful and good manner. The receptionist was welcoming on our arrival and very helpful, the room was fine though the bed was a bit old and saggy. The breakfast was also good and plentiful. Nice, clean, quiet and very good situated in the 9th arrondissement in Paris. We will come back for sure. The location is brilliant: the best shopping possibilities are near and it’s only a nice walk away from Montmartre and Pigalle. Metro stations and many good restaurants also nearby. Clean and modern rooms and friendly service. The breakfast is simple but very delicious with just enough options to choose from.